Looking For Help to Plan & Host Your 1st Successful Webinar Without Frustration? Then You Need This E-Guide! 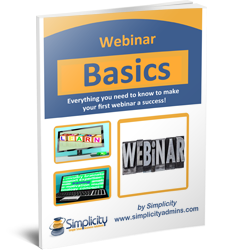 In this 20 page long e-guide called Webinar Basics I will teach you everything you need to know to host your 1st successful webinar! In the 8 sections I take you from the planning to the follow-up, step by step. It’s taken me months and months of research when I hosted my 1st webinar. Learn from my mistakes, get the fast-track version in this handbook which is ideal for the nervous beginner who likes a step-by-step guideline. Tips for the Big Day! So go ahead, TAKE ACTION, create your first successful webinar & dazzle your audience! For ONLY 9 USD this guide is yours!